As the old adage goes, “the kitchen is the heart of the home.” Though this may have been true in the past, our modern lifestyle may be proving otherwise. Today, the average working Canadian (aged 24–65) is tight on time and spends fewer than 50 minutes cooking and cleaning up meals per day. This time crunch has many people turning to faster, more convenient foods. But with numerous health benefits and the ability to lower cholesterol, which is a risk factor for heart disease, what barley lacks in speed it makes up for in health benefits. “It is so good for you, and everyone has forgotten about it, yet it has been on the prairies forever,” said Keri Moline, sales manager with Progressive Foods. Moline explained that the market is changing and while consumers are looking for convenience they’re also seeking out local and “good for the body” foods. As an agronomist by trade and an entrepreneur by nature, Nakonechny didn’t want the benefits of this local crop to go unnoticed. So, with a mountain of research, Nakonechny and Progressive Foods worked to find a way to bring convenience and barley’s health benefits together. 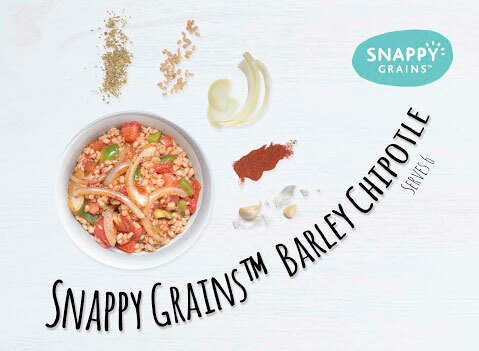 This past year Progressive Foods launched Snappy Grains™, and with it, two easy-to-use products made from 100 per cent Canadian barley. Through a unique pre-cooking process, both Snappy Grains™ Natural Barley and Organic Barley take only 10 minutes to cook, yet keep the taste, versatility and health benefits of hulled barley. And they’re doing just that. To whet your palette and inspire more Canadians to cook with barley, Progressive Foods has developed a number of quick, simple, and most importantly, tasty recipes (find the recipe for Barley Chipotle below). A lot has changed over the years, and while Snappy Grains™ may not be the slow cooking barley your grandma knew, Progressive Foods is encouraging one tradition, bringing barley—and its heart health benefits—back to the kitchen. Find Snappy Grains™ products in over 600 stores nationwide, including PriceSmart Foods, Cooper’s Foods, Overwaitea Foods, all Save on Foods stores and at Co-op as “Gold Pure – Barley Quick Cooking.” For more information about Snappy Grains™, vendors and recipes, visit progressivefoods.ca. Heat the olive oil until hot. Add onions and sauté for 5 minutes or until soft and translucent. Add green peppers and garlic, and cook for another 5 minutes until both the garlic and peppers are soft. Once the vegetables are soft, stir in Snappy Grains barley. Add the chipotle chilli powder, tomato paste, salt, cumin, oregano and honey. Cook for 2 minutes, stirring constantly to mix the ingredients thoroughly. Add the tomatoes and stock and bring to a boil over medium-high heat, stirring frequently. Once the mixture is at a boil, reduce to a simmer, cover and cook for 15 minutes, stirring occasionally. After 15 minutes, check the mixture. The barley should be tender, yet firm. Remove from heat and cover for 5 minutes. The barley should be fully cooked, with some moisture in amongst the grains of barley (if necessary add a little stock). Once done, stir and serve. Serves 6.